Wake up in bed and look out at the ocean! You will enjoy views of the Atlantic Ocean, beautiful beach and pool with BALCONIES OFF THE LIVING AREA, MASTER BEDROOM, AS WELL AS A BALCONY OFF THE GUEST BEDROOM. DIRECT BEACH ACCESS. Walk to golf and tennis. Adjacent the the Oceanfront Marriott Resort and Spa. at 1 Ocean Lane. Our Villamare Oceanfront condominium's superb ocean views make it one of the most desirable in the complex. 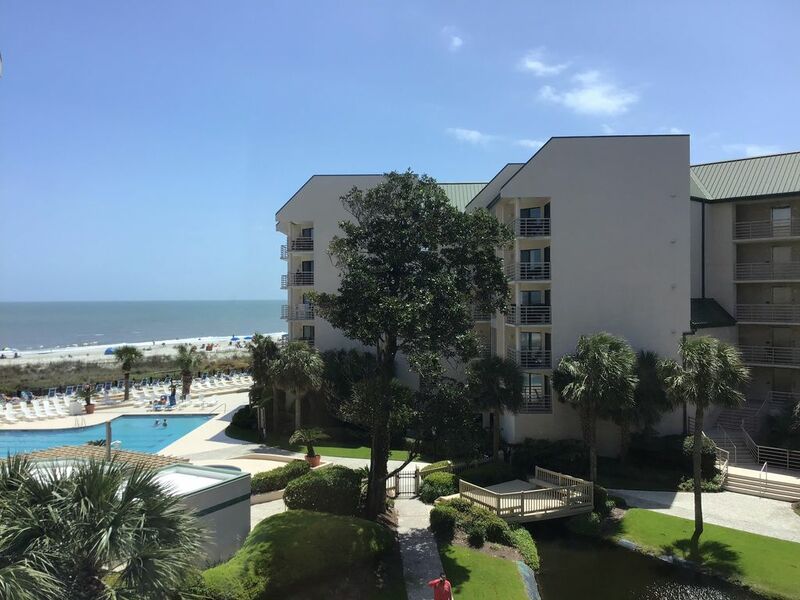 Our villa is located close to the pool and the finest sandy beach on Hilton Head, a short walk for the little legs hauling beach toys and shovels. We are in Building #1 (there are 3 buildings). We have a great LOCATION LOCATION LOCATION. Also easy for the grownups carrying our beach chairs and umbrellas down to the beach. The Villamare includes an oceanfront pool and hot tub. The complex has an indoor pool, sauna, and exercise room. Our villa is on the third floor of building number one. Our bright and sunny villa is beautifully furnished with all the amenities, updated furnishings: new living room sleeper and love seat, chair, new dining set and bedspreads throughout. Everyone loves our KEY LESS ENTRY, an open kitchen with a granite breakfast bar. THE SPACIOUS OPEN GREAT ROOM FLOOR PLAN LETS YOU SEE THE OCEAN FROM THE KITCHEN WITH YOUR FIRST CUP OF COFFEE IN THE MORNING.The views from the living room and master bedroom are shown in the pictures. Everyone who stays here raves about the view. The fully furnished living area includes a queen sleeper and loveseat, 50' flat screen TV, and DVD player. FREE WI FI and FREE NATIONWIDE LONG DISTANCE. Our balcony has a table and chairs for alfresco dining when you do not want to go out. The Master Suite is separated from the living area by French doors and also features a balcony off the master bedroom, a king-sized bed with a pillow top mattress, flat screen TV, and a raised bathroom vanity, jaccuzzi tub and private walk in shower. The large guest bedroom suite has two queen beds with eurotop mattresses, its own full bathroom with a large soaking tub, walk in shower, large flat screen TV with a DVD player. and a second private balcony. AFTER STAYING HERE, YOU WILL JOIN OUR MANY GUESTS THAT RETURN YEAR AFTER YEAR. YOUR VILLA IS CHECKED BEFORE YOUR ARRIVAL TO INSURE THAT IT IS CLEAN AND READY. WE HAVE ARRANGEMENTS WITH A LOCAL COMPANY TO CONTACT FOR EMERGENCY REPAIRS THAT MIGHT ARISE DURING YOUR STAY. WE TAKE PRIDE IN OUR VILLA AND YOUR COMFORT DURING YOUR STAY. YOU CAN CALL US WITH QUESTIONS YOU MAY HAVE. WE VALUE OUR REPEAT GUESTS. THIS IS A NON SMOKING AND NO PET UNIT! NO EXCEPTIONS. The Villamare is the ultimate semi-tropical oceanfront resort with the best location and 400 ft. wide beach on HH Island. Villamare's beautiful grounds and onsite amenities include an olympic size oceanfront pool, kiddy pool and hot tub, an indoor health club (indoor pool, hot tub, sauna, and exercise equipment) ,intertwining walkways and lagoons, barbecue area, sitting areas, and covered parking. Drive into the Palmetto Dunes Gates and park your car! You can walk to the world renowned PD Tennis Center, Robert Trent Jones golf course, the Fazio and Arthur Hills courses, Alexander's restaurant, the General Store, as well as Fish Creek Landing for bike and canoe rental.We even have a seasonal PALMETTO DUNES SHUTTLE that takes you to Shelter Cove, and nearby Mall & Shopping. THIS IS A NON-SMOKING AND NO PET VILLA. I have always loved the ocean, rain or shine.I shopped for years until I found this perfect location to recharge any time of year, from looking out at the sparkle on the pool and ocean, to enjoying the beach life with family and friends. You can see the pool, beach, and ocean from all the rooms, including the master bedroom bed. Our complex is a beachfron property. Our building, #1,is the closest to the beach. You can hear the waves at night from the balcony. On site Health Club for all guests. On premis Health Club with latest in workout equipment, Indoor and outdoor Pool, Indoor and outdoor Hot Tub,Indoor Sauna, No Smoking. Boardwalk to Marriot Hotel next door. Beach Bocci, Canoeing, Dolphin watching, Dining and Dancing at nearby hotels and nightclubs, Dinner cruises, Moonlight walks on beach JUST LOOKING OUT AT THE OCEAN AND ENJOYING THE VIEW. Great golf and tennis facilities right here in Palmetto Dunes. Make sure you ride the free Dune Buggy Shuttle to near by Shelter Cove. This harbor setting offers dinner cruises, fishing charters and dolphin watch cruises. Call ahead and make reservations at some our favorite places. The Jazz Corner - use this for a special adults only night. Alexander's - You can walk to this one. Great setting. Omni Resort - Just up the beach. Late night dancing. Santa Fe Cafe - Roof top Dining. We love their Rib Eye. Pool Bar at the Marriott - Walk next door from the Condo on that afternoon you don't want to go in for lunch.